Today's Hasbro panel at San Diego Comic Con was full of surprises, including the reveal of several upcoming 6-inch Black Series figures. 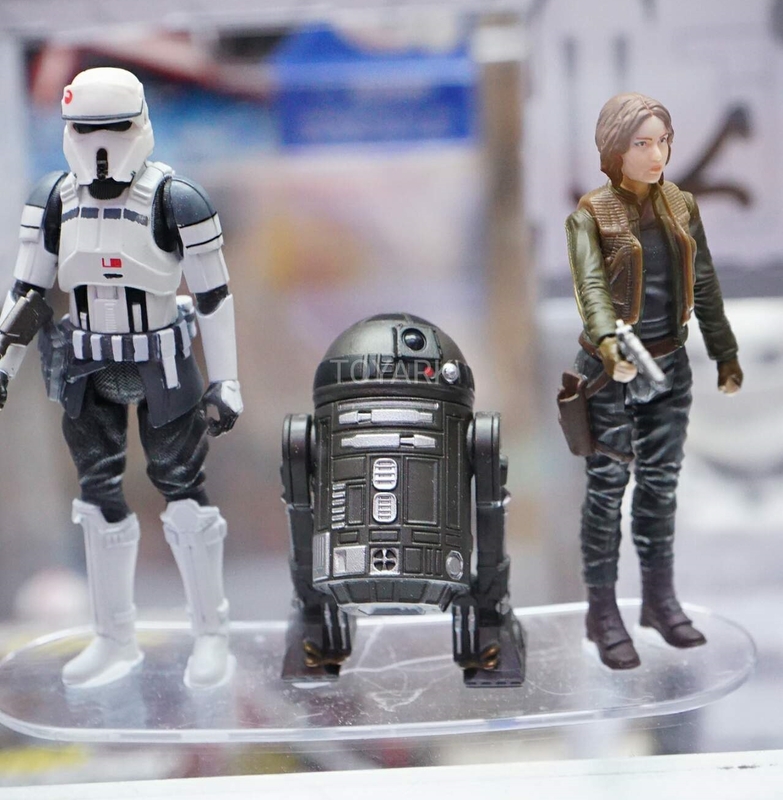 In addition, we got our first look at some more toys for Rogue One: A Star Wars Story. Yesterday a covered display case was spotted at the Hasbro booth, which led us to believe more action figures from Rogue One would be unveiled, in addition to the recently announced Jyn Erson Black Series figure. As it turns out, they didn't just have action figures to reveal. 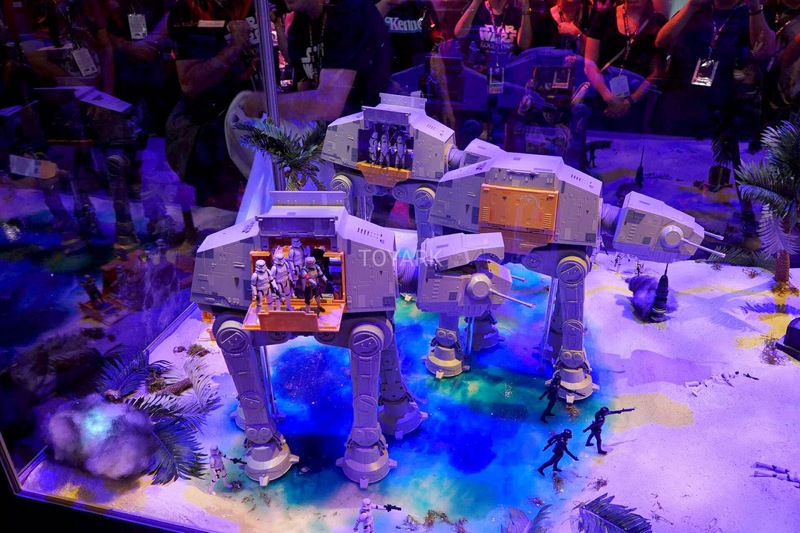 Hasbro AT-ACT revealed #SDCC #starwars It actually walks!!! At the panel the Hasbro team showed off 3.75-inch scale AT-ACT, as seen in the trailer for Rogue One. By far the biggest selling point the vehicle has to offer is the fact that it actually walks! The walker can be controlled via your smartphone and can even fire Nerf darts. The previously covered display case turned out to be a Scarif diorama that included three of the walkers in motion. The sides of the walker fold out and can carry action figures. We can assume this set, along with all other Rogue One collectibles, will be in stores on Force Friday on September 30th. Keep following us on Twitter and Instagram for more updates from San Diego Comic Con and more! Just 5 points of articulation?..huge let down..
For fans of the classic figures, 5 points of articulation is no let down at all. but kids don't like to pose there figs, they use there imagination and there figures together. Then buy vintage figures. Things have evolved since 1978. As a kid who grew up during The 2008 Clone Wars, I can say kids love articulation. We kids like articulation, 5POA is lesser quality and cheap. We like to pose figures not use our imagination. Things have evolved not to go back to older technology. This is Star Wars by the way. Am not biting for this 5 poa crap. I was caught with The Force Awakens. Very clever marketing because I now have the main characters in all 3 formats, when all I wanted was 3.75" articulated. Well that is all I will buy this time around and I have more patience than last year.